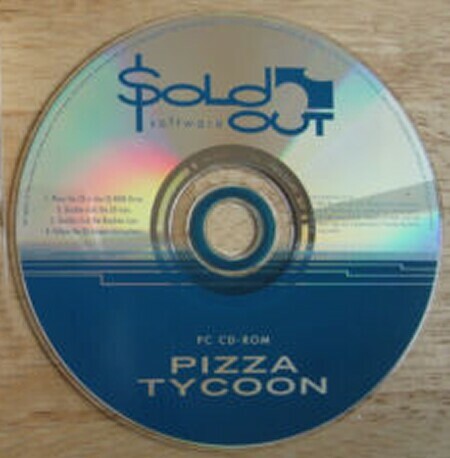 Pizza Tycoon is a simulation about achieving wealth and power in two opposing areas -- legitimate and criminal. 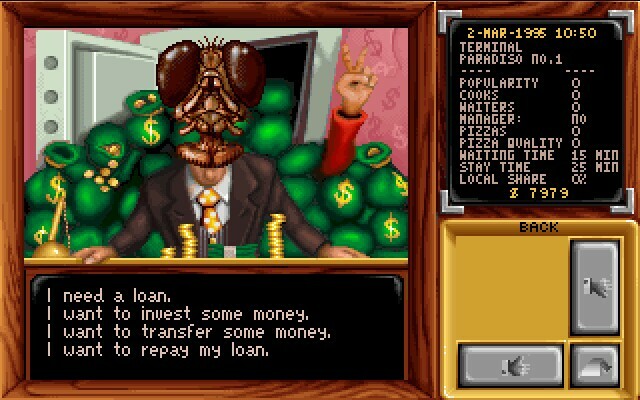 The game combines MicroProse level strategy, business management, and a heaping does of gangster humour, all joined by a very unusual premise. 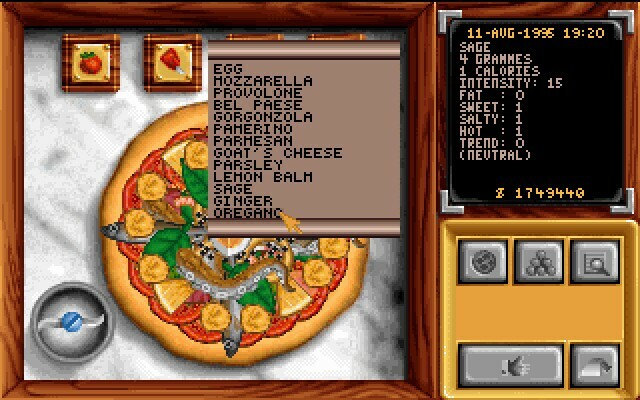 You begin Pizza Tycoon as a small-time chef struggling along in a tiny rented pizzaria complete with secondhand furniture. Your aspirations, however, are much greater than your dire situation. You want to make the big-time, and this path involves becoming a Mafia boss armed with a worldwide chain of profitable restaurants as your legitimate front. Your trip to fame and fortune is rife with danger from your mob connections and beset with the pitfalls of unwary businessmen. As an aspiring Godfather you will carry out attacks on opposing restaurants and sabotage their businesses, work the subtleties of shady arms dealings, bribe political leaders, donate to appropriate charities, all while trying to maintain an honest public image. You must be discreet as the ever-watchful eye of the law is looking in your direction. This is only one-third of the battle. The next third revolves around your business acumen. To reach the top enter a world of riches you need to rule your corporate empire with a sharp mind and iron hand. You will run the entire gamut of business management: Negotiating with banks for favorable interest rates, launching brilliant advertising campaigns, and hiring the upper levels of staff for your company. Hiring good management is critical, as they run the day-to-day operation of your restaurants, and do the shopping, pricing, and support staff hiring. You need to be a smart employer -- if you bring people on board who have low trustworthiness will rob you blind. You also need to be generous when appropriate -- your competition can and will steal your star talent with lucrative job offers. With the right blend of shrewdness and guts you can expand your chain in ten cities around the world. As you develop an international presence you had better keep a steady eye on your operations or you will slide into oblivion. The final third involves your creativity, marketing skill, and talent as a master chef. Remember, you set the direction of your company. One of your most important responsibilities is creating the product-line via your personal pizza recipies. Your goal is the ultimate menu -- a combination both profitable and popular. The design aspect is quite fun as you work with over fifty toppings and ingredients. Be a culinary artiste! The result of your efforts can be initially mysterious. For example, a recipie you would not dare serve your spouse might have great appeal to a particular type of customer! However, if such experimentation is not your forte, you can use the cookbook included with the game to create traditional dishes. You can guage the success of your setup through resarch on eating trends, as well as through pizza contests against competing restaurants. In keeping with managing the direction of your businesses you are also tasked with creating the look of your chain. This is not an easy task! You must balance your restaurants with the right combination of furniture, food preperation equipment, flooring, decorations such as flowers and fountains, as well traditional staples such as slot machines, TVs and jukeboxes. You can even select the style of music and type of broadcasts played in your chain. There are many vendors from which to choose but each will have a different impact on the bottom line of your empire. Keep your restaurant well stocked with the right inventory. Do not fall into the trap of over-economizing on key ingredients. Buy products of somewhat higher quality than you might need. Maintain a fairly big menu, with most of the standard dishes plus a rotating trendy section. If you keep stocks in your restaurants for a long time their quality will deteriorate; too much so and they will go bad and must be thrown away. As I mentioned, food goes bad much more quickly in summer and higher quality ingredients will have a longer shelf life than budget stock. Remember the amount you need to stock can change radically as customer demand changes.